I knit this swatch after I had knit some of the other ones I’ll be sharing with you this week. To make this swatch, I frogged the other swatches — I re-knit this yarn 4 times! I think, in part, this is the cause for the unevenness in my stitches…at least, to some degree. In the top left of the photo about ⅓ of the way down from the top, you may notice that some of my stitches seem to be made out of thinner yarn than the rest. I can’t blame this on the yarn: I think after knitting and frogging so many times I actually may have stretched segments of the yarn out of shape. Perhaps if I had blocked this swatch more aggressively (wet blocking rather than a bit of steam), I might have been able to hide this better. Still, Bella Cash isn’t a wilting flower…even after being re-knit so many times, much of the swatch looks fine. 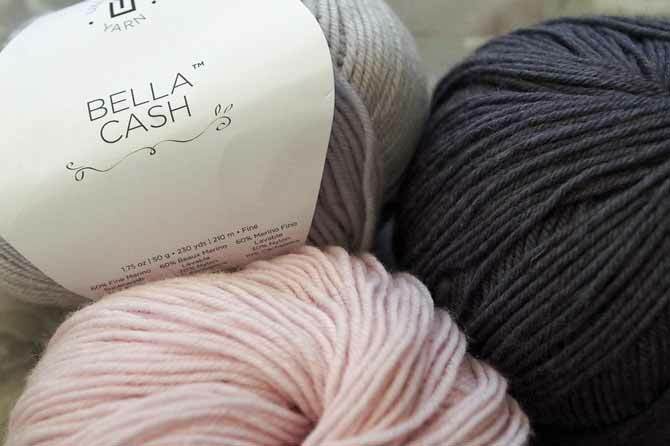 Sophisticated, delicate, yet sturdy, Bella Cash will become my “go to” yarn for elegant shawls and garments. I also switched from wood needles to metal needles half-way through the swatch. You can definitely see the shift in tension where that happens…note to self…get rid of those 20-year bamboo needles. The patina on them is sticky now. Now, to the Brioche swatch. It’s only 1 swatch… and at least the Bella Cash is pretty! My rough attempt at Brioche stitch taught me much. I began (at the bottom) with two-color rib, then went into corrugated rib, and upward to Brioche. As I describe the different sections of this swatch, I’ll share some wisdom I gleaned from this swatch, and what I would do differently next time. The cast on was fine. I tied the 2 colors together into a slip knot and placed it on my 2 needles held together. I used the Old Norwegian cast on, alternating the colors used for the loop and the securing strands underneath the needle. Then, I did several rows of 2-color ribbing where I bought both yarns forward for the purl stitches even though I only used the one color to purl. I knew this wasn’t Brioche, but I wanted to see if it would work as a good edging. I really like how it looks and it does complement the Brioche, but it doesn’t have the fullness of Brioche, so it definitely cinched in the fabric. At this point, I had frogged my swatch 3 times because I hadn’t gotten the right cast-on and I didn’t like the effect when I jumped right into the Brioche. On top of this, I had used needles that were too big, and I wasn’t going to frog again. 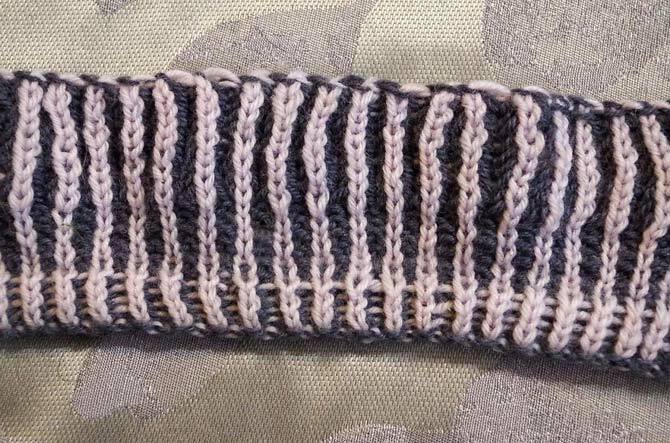 However, I did want to try a different 2-color ribbing, so in the middle of the swatch I tried corrugated ribbing. In these rows, I only brought the purl stitch color forward to purl and then returned it to the back as a float when I worked the knit stitches. On the reverse side, you can see the floats. Corrugated ribbing has definite right and wrong sides. This defeats the reversible feature of Brioche, so using corrugated ribbing was out. 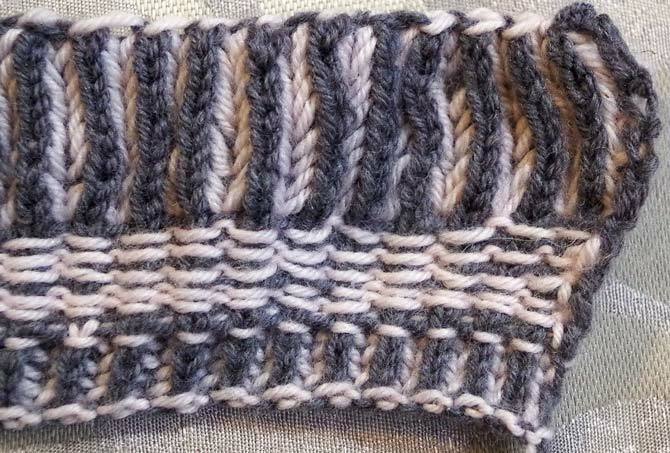 The charcoal gray Bella Cash stands out on the the wrong side of a brioche swatch with the corrugated ribbing showing. Next, I went into the Brioche section. What I’ve noticed with Brioche is that, in some cases, the light color pops out more when it’s the knit stitch side than the dark, and in other cases the dark color pops more. I really have no idea why this is the case, as I’d think that the light color would always pop. Perhaps it’s the saturation of the hue that matters. 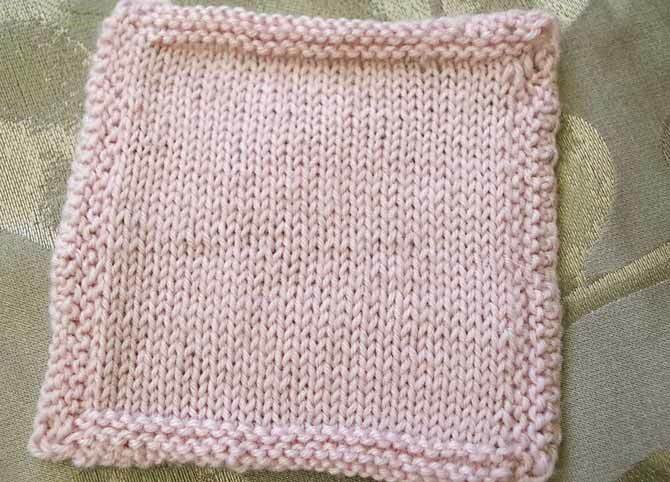 At any rate, in my swatch the pink yarn is shouting the loudest. Pink rules! The light color of this Bella Cash really catches the eye! I was a bit overambitious with this swatch. First, I still think the needle size I used was too large and that it made the stitches uneven. Second, I tried one-pass 2-color Brioche. Normally with Brioche, you knit on double-pointed needles or a circular needle so that you can knit the first pass in one color, then the second pass with the other. I learned the 2-pass approach from Very Pink, a helpful video. Thanks to podcaster Nathan Taylor (Sockmatician), I was able to jump past the 2-pass system and try one pass. I do love the 1-pass approach even more, but for my first attempt (well, officially my 3rd, as I frogged the first 2), my tension is very uneven. I did a lot of experimenting with various knitting styles. I tried combination knitting purl, the Norwegian purl, and the continental purl, which I think contributed to the lack of consistency in my swatch. Again, I can’t fault Bella Cash for this! The softness and fineness of Bella Cash really does look great in stockinette stitch. Lastly, perhaps, a sport weight yarn, wasn’t the best yarn to use to learn Brioche, either. I should have tried something less delicate. I was just so taken with the gray and pink combination of these Bella Cash yarns and pushed on. Maybe when I’m a bit more experienced at Brioche, this will work better. Come back tomorrow to see how a different 2-color technique really shone when I knit with Bella Cash. What happens when you knit in the stitch below? Just getting back into knitting, now that I have a bit more time. I have enjoyed reading this blog and it has inspired me to start again. The Brioche stitch is definitely on my “knitting bucket list”. Thanks for the insightful tips & observations…inspired to have a go at it myself. Wonderful knitting and an enjoyable read.